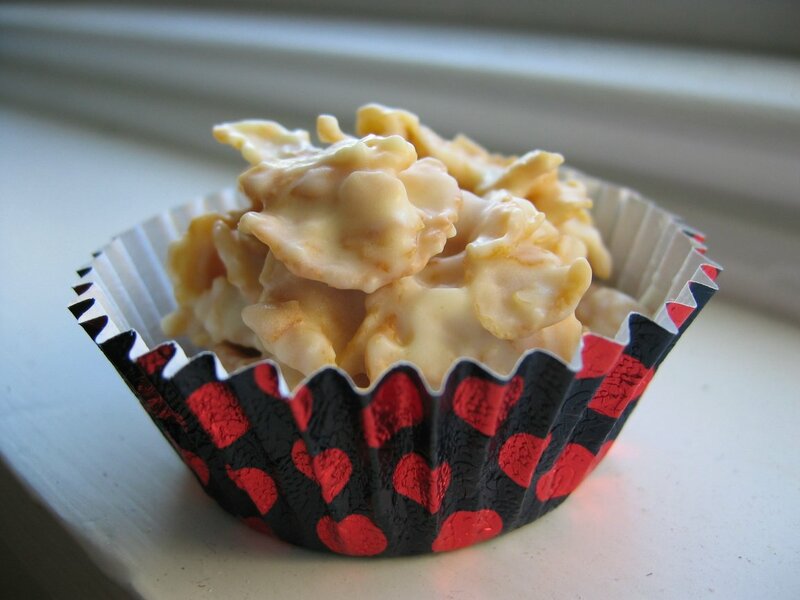 Posted by cath in cakes and treats, easy, Recipes. Everyone loves these cakes, but I’m posting this recipe especially for Col…these cakes take around 10 minutes to make, after about an hour in the fridge they are ready to eat! Basic Recipe makes about 12 cakes. 200g Good Quality Chocolate – this can be Dark Chocolate (min 60% cocoa solids), Milk Chocolate or White Chocolate – it should be broken into small pieces of roughly the same size. Place the chocolate pieces, butter and syrup in a heatproof bowl. For white chocolate and/or AGA cooks – boil an inch or so of water in a saucepan, remove it from the heat then place your heatproof bowl on top to melt the ingredients together. The heat from the water should be sufficient to melt everything. Alternatively you can put the bowl in the microwave for 2-3 minutes, in short 30s bursts, stirring each time. When almost fully melted, stop heating and stir well until smooth – the heat of the bowl and mixture should help melt the last few bits of chocolate. Melt the chocolate, butter and syrup: stir until most of the chocolate is melted and smooth, then remove the bowl from the heat (take it off the saucepan!) and continue stirring until the larger chunks of chocolate are melted and the mixture is smooth. Add the cornflakes, 1 handful at a time, stiring until they are all thoroughly coated. Then add another handful and repeat until you have a good thick coating on the cereal – you may have to add more or less cornflakes depending on the amount of butter and syrup you added to the chocolate initially. Place a heaped tablespoon of mixture into each paper case (or place them all on a buttered baking sheet) and refrigerate until set. Valrhona Grand Cru Noir Manjari Gastronomie Chocolate (64% cocoa) makes luxury dark chocolate crispies. Other cereals could be used instead of cornflakes. To go with Dark Chocolate, add up to 50g of butter and/or 4 tablespoons of golden syrup to the chocolate and melt together. With Milk/White Chocolate add up to 25g butter and/or 1tablespoon of golden syrup to the chocolate. Experiment with other combinations: use different syrups, add dried fruit or nuts, other cereals etc. When using additional sugar and butter, more cornflakes are usually needed to complete the mix. Tip # 1: Be careful when melting chocolate! If the bowl is warm and most of the chocolate is melted, REMOVE FROM THE HEAT (this means taking it away from the saucepan and hot water) and continue to stir, allowing the chocolate to melt gently. Overheating the chocolate will produce a grainy texture. It will look dry and thick rather than glossy and smooth. There is nothing much that can be done with overheated chocolate – for cooking anyway, so start again with a fresh batch. White chocolate is much more sensitive to heat, so take extra care when melting it. Tip #2: Microwaving chocolate – be careful not to microwave chocolate for long blasts (more than 30 seconds) as chocolate pieces appear to remain whole and unmelted, but in fact they will hold their shape until you stir them smooth and so they could easily overheat. Tip #3: Don’t let any water come into contact with chocolate that you want to melt, the bowl and spoon must be completely dry. Don’t add any cold liquids (i.e. extra syrup) to the chocolate once it’s melted. Additions at this time will also produce a grainy texture as they will cause the chocolate to cool suddenly. What to do with chocolate that has overheated/become grainy? I’m just about to try some as a chocolate spread on toast…will let you know how that goes (hmm – OK but not very easy to do!). Also melting into cream can usually recover slightly overheated chocolate, but won’t help make these cakes! I’ve made some edits to the post, hopefully this will emphasise the rules of melting chocolate! I hope you have another go, and best of luck this time! As I have never made crispy cakes before, I’d like to thank you for your recipe tips, after 2 batches of over heated chocolate. I decided to find out what I was doing wrong and so came across your site. THANKS….got it now ! That’s fantastic, I’m glad my advice was useful! Hopefully there is some reasurrance for Colin there too…it’s easy once you remember that chocolate requires a bit of special attention, I hope he will also be giving it another try…!?! we over heated the chocolate so it went wrong very fast thats a hard recipie . but i ate the chocolate anyway it was nice . Ah, what a shame! Remember to take the bowl completely off the heat before all the chocolate chunks have melted…the larger bits will melt easily (if not quickly) in the residual heat. Just keep stirring and be patient, I know it’s difficult with anything chocolate-related. I assure you though, that a bit of care with the chocolate melting stage and that’s all there is to it…you’ll soon be making chocolate crispies like a master-chef :) I hope you’ll give it another go…? Heya umm… when i made one batch i over heated the chaocolate so i had to add some milk to it but they havent yet been in the fridge for long so ill have to see whats gone wrpng! Well Georgii, please let us know how the milk addition worked out, that could be quite a good option for those using darker chocolate. I hope you enjoy them! I made this with a slightly more healthy option…. 70% dark chocolate, bran flakes, walnuts and raisins, with low fat margarine instead of butter and honey instead of syrup… delicious!!! I was overcooking the chocolate to start with too. oops. But thanks for clearing up the method! If you want to go a step further?! I sometimes cut out all the butter and syrup to make a pure dark chocolate mix. It sets hard like the original chocolate bar and is very tasty too. As dark chocolate is supposed to be quite good for you (in small quantities), it makes a somewhat-healthy treat. The combination you picked of bran flakes, nuts and raisins sounds good. I wonder what other cereal combinations are popular – any suggestions? Keep them coming! Hi, Sam. What an interesting idea to use peanut butter as well! Thanks for your comment, enjoy the recipes, I’ll strive to do more in 2009! i love crispie cakes especially your version! !i make a batch every week!! Just made them with my three year old. Not nearly as sophisticated looking as your white chocolate ones, but delicious nonetheless. We added chopped apricots and brazil nuts in a vague bid to be healthy! Thank you. i added my butter at the end and it separated. drained off the butter,mixed in a few teaspoons of creme frache stirred until it looked like melted chock again and they are fine. What should i do to improve this? Not sure! do you mean that the chocolate was like this before you started? can’t understand how it would be dry afterwards, but I’m guessing overheating might do that. mmm try using rice crispies instead. delicious! wow i tried these with my mum and they look really good!! 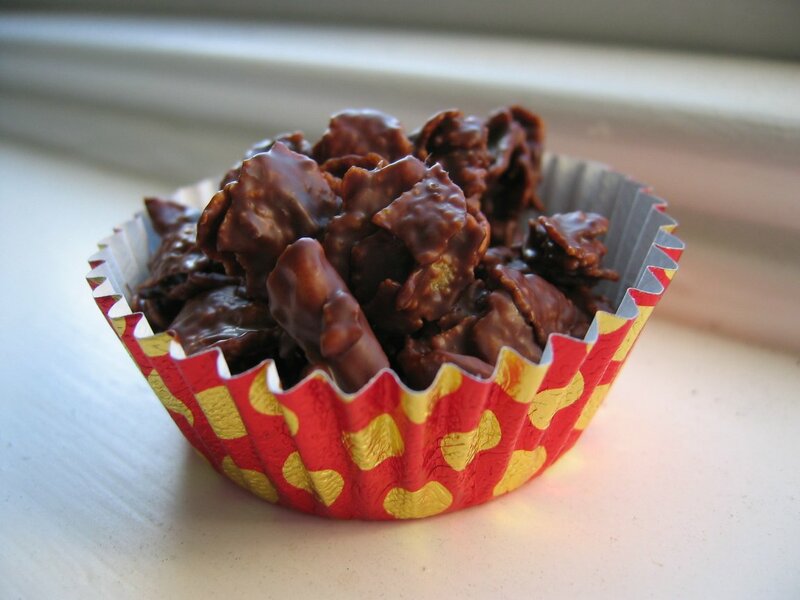 they are in the fridge now and we will have them after tea :) we used chocolate crispies instead of flakes but they worked out fine :) thank you as we looked in all our cook books and it wasnt in any of them!!! thank you – could never understand why my chocolate mixture suddenly turned into a fudge lump once I added the cold butter and syrup! Lesson learnt. salt, baking powder and the ground almonds. onto to the food that you have to handle next. 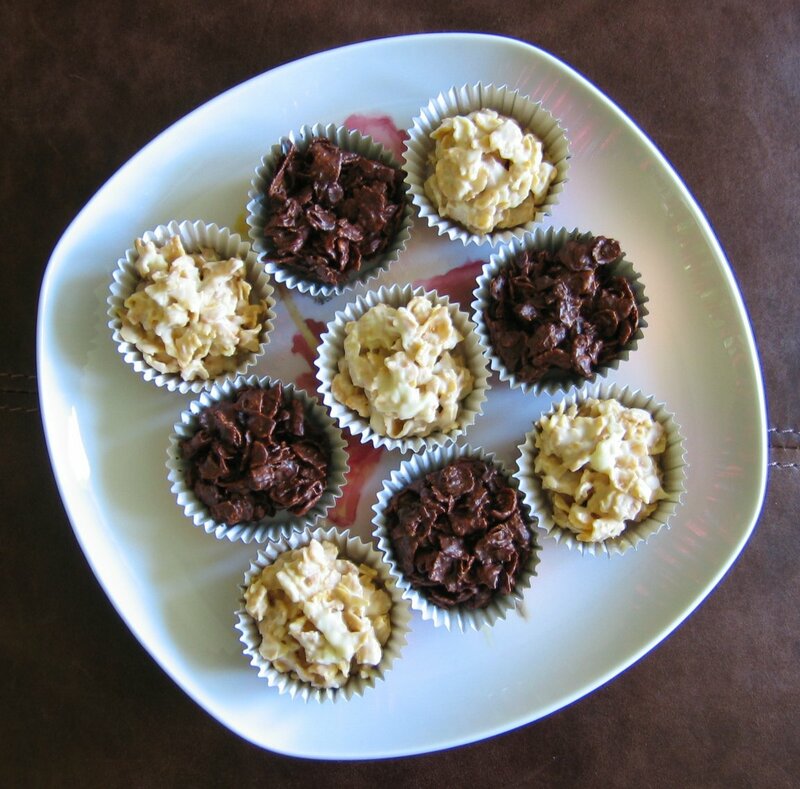 Easy Cakes >Chocolate Crispy Cakes | cookalicious. book-marking for a few of my websites but wasn’t sure if it would produce any positive results. Many thanks. Hello there, simply was alert to your weblog via Google, and found that it’s truly informative. I am Italian and I just came to England and I am in love with baking cakes, I used to work at a Home-made bakery shop and it was cool. So I wanted to learn how to make crispy cakes because at a times it is not good. But thank you for helping this really worked. Ciao!! My overheated dark chocolate & syrup mix turned into a dough-like substance, so I kneaded in some crispies and made some yummy little crispie chocolates instead. I left out the butter for a dairy-free version, perhaps I should have added a butter-substitute instead. Aw, this was an exceptionally nice post. Taking the time and actual effort to produce a superb article… but what can I say… I procrastinate a lot and never seem to get nearly anything done.